← April 29, 2016 – Bagel breakfast! This penne dish is fast becoming a favorite go-to dinner. By the time you heat the water to boiling and cook the pasta, all the vegetables are ready. The only think that needs to be timed more precisely than the cooking of the penne is when to put the asparagus into the already cooked mushrooms and onions. I leave the tips out until the last second because they will pretty much be cooked enough by being with the just cooked penne. Add the peanut sauce. Be sure to save some pasta water to thin out the sauce! 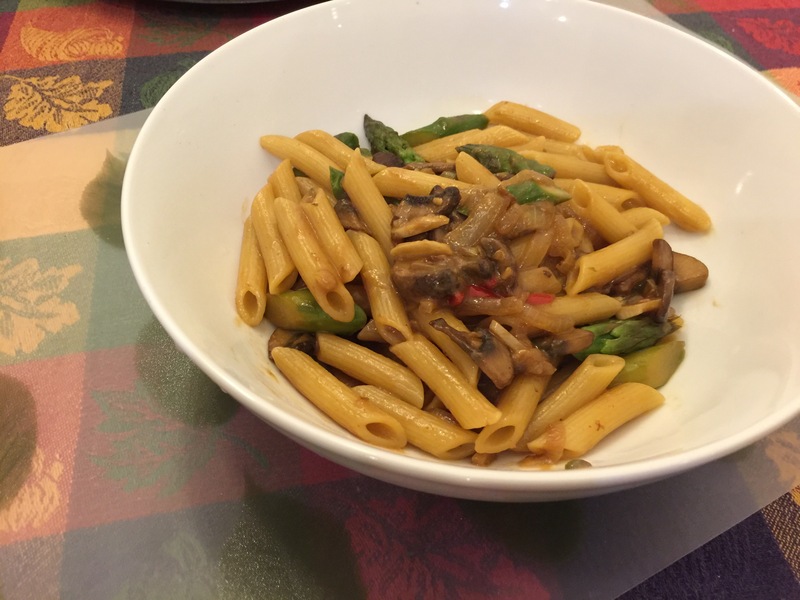 This entry was posted in Vegan, Vegetables, Vegetarian and tagged asparagus, Fresno chile, garlic, mushrooms, onion, Peanut sauce, penne. Bookmark the permalink.